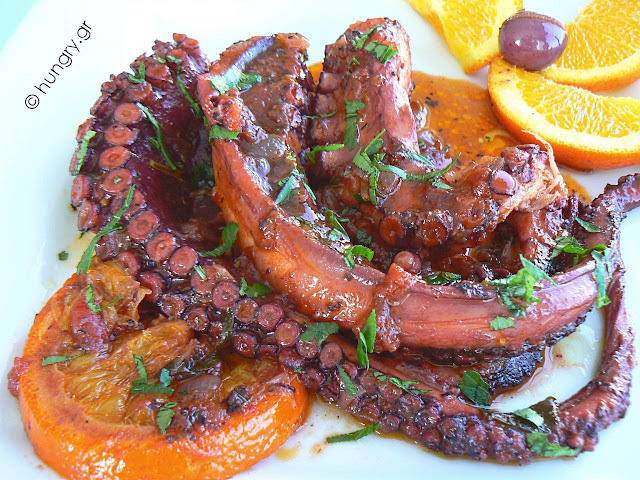 Octopus with the intense aroma of orange and the flavor of olives. The white wine provides a heady aftertaste and intensity to the food's flavor. Cooked just to soften the meat and thicken the sauce. 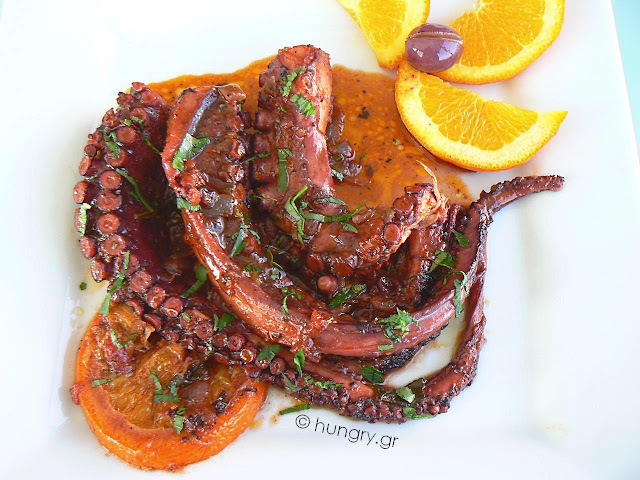 A delicious dish for those fasting. Wash and drain the octopus. Put in the pressure cooker without adding water, it will draw its own. 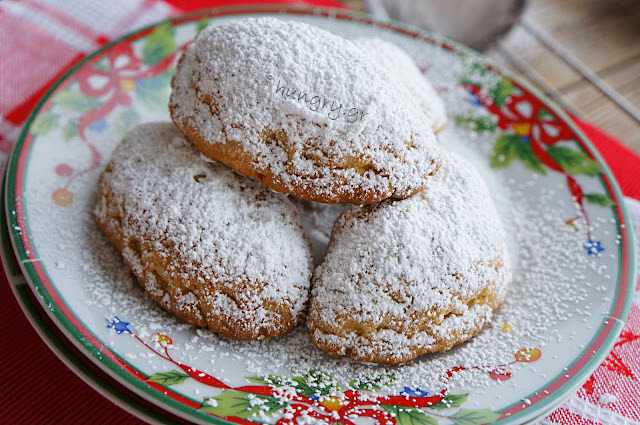 Cover the cooker and cook in low heat for 15'-20' until tender enough to golden brown. 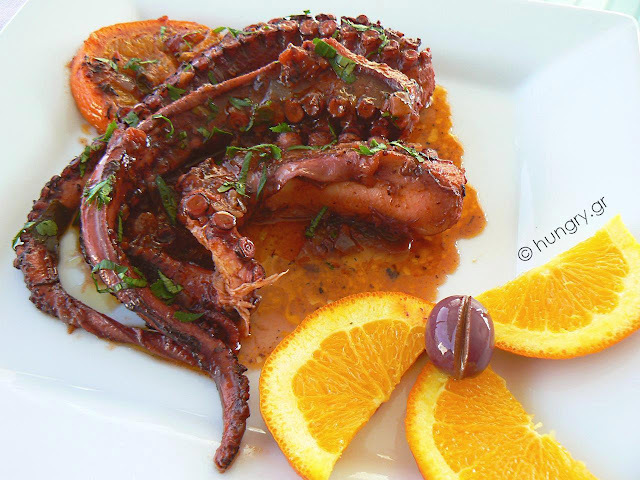 Remove from heat, let the octopus cool slightly and cut into pieces or leave the tentacles whole. As you prefer. 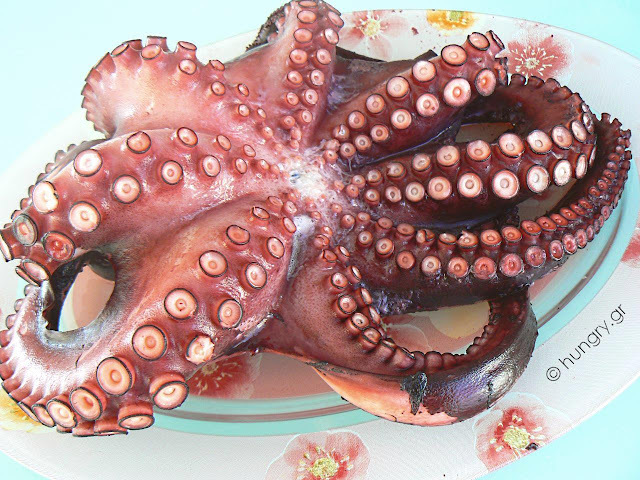 Remove and discard the tooth of the octopus. Cut the hood into strips. 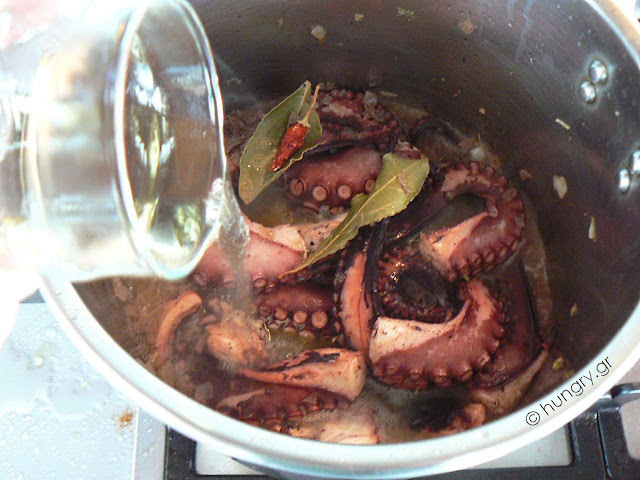 Keep a little broth from the boiling of the octopus, in case it is needed later during cooking. 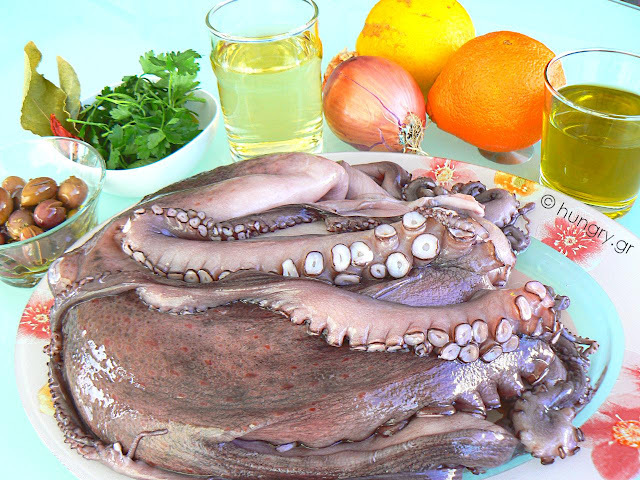 In the cooker, that you boiled the octopus, add the olive oil, the chopped onion and let it boil for 5'. 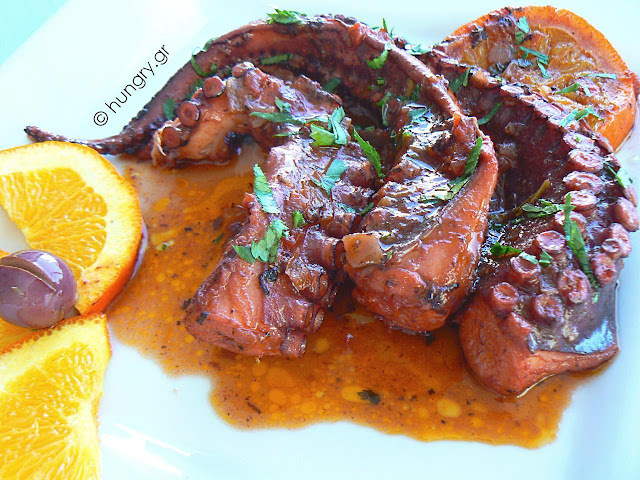 After a while, add the parsley and the cut pieces of the octopus. Mix gently to saute. Add the bay leaf, pepper and the wine. Let it boil well, for the alcohol to evaporate. Cut the orange into slices and each slice in half. 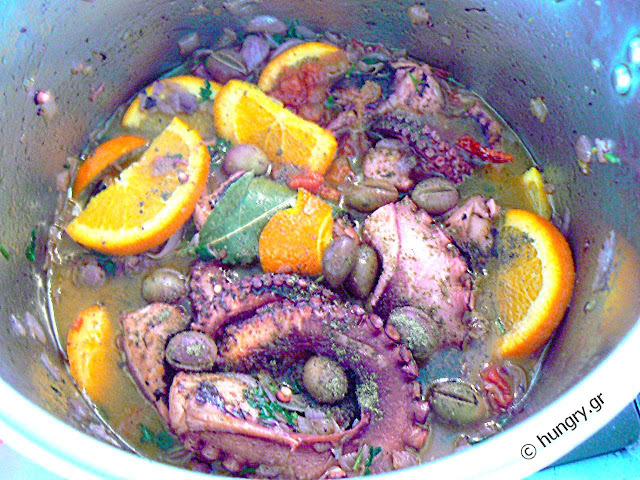 Add to the cooker with the octopus. Add the pepper, olives and tomatoes, drained, without the juice. 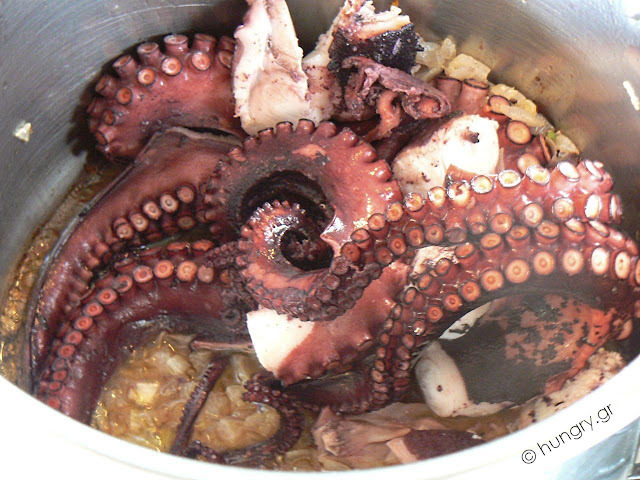 If necessary add a little broth you kept from boiling the octopus. Seal the pressure cooker and cook for 15'. Open the pressure cooker and if you have too much broth, let it simmer with the lid open, about 5 minutes for the broth to thicken. 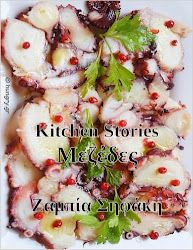 When you cook octopus adding salt is not necessary. The combination of pasta and seafood, especially shrimp, makes a delicious result that very few would have objected to taste! This proposal is simple yet offers a complex taste! 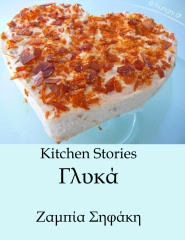 If you have never enjoyed it from your hands this is an opportunity to try it. The key parameter for its taste is the freshness of shrimps. You can use frozen, but the flavor of sea will be less pronounced.